Turkish President Recep Tayyip Erdoğan's bodyguards pummeled protestors (the 3rd such incident on U.S. soil in 16 months) as he addressed the Turkish American National Steering Committee in New York City on September 21, 2017. For the past few years, the international Muslim Brotherhood has found a welcoming home in Ankara in the face of opposition from Saudi Arabia, Egypt and the United Arab Emirates. Consequently, U.S. Islamist organizations have also turned to the Turkish regime for collaboration and support. On September 18, a Washington, D.C.- based organization, the Turkish American National Steering Committee (TASC), hosted an event in New York City with Turkish President Recep Tayyip Erdoğan. "US-based Muslim Brotherhood supporters have a busy week coming up," the Middle East analyst Eric Trager noted. "They're hanging with Erdoğan on Monday, protesting [Egyptian President Abdel Fattah] Sisi on Wednesday." 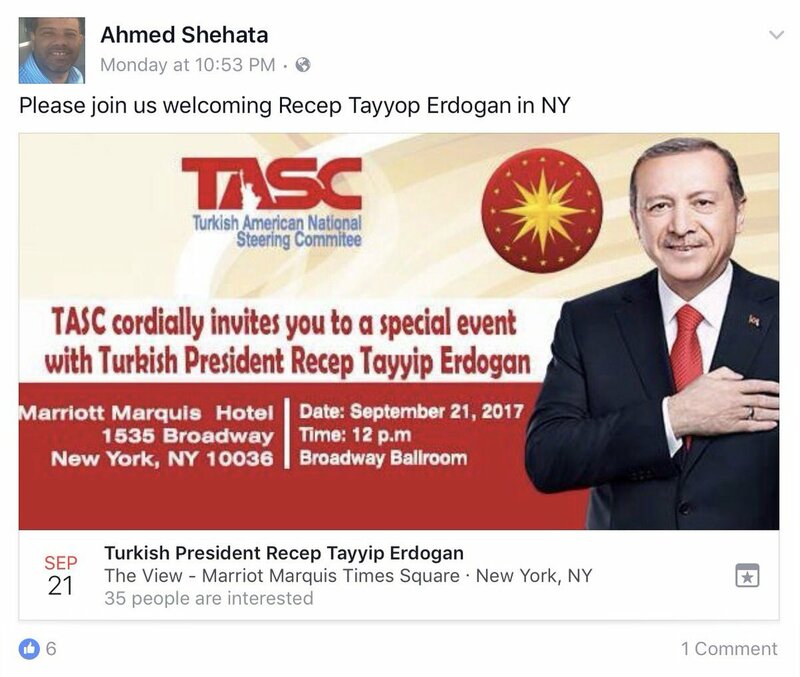 Organizers of the TASC event included Ahmed Shehata, a lobbyist for the Muslim Brotherhood who has also worked for Islamic Relief and the Muslim American Society -- two prominent Islamist groups designated as terrorist organizations by the United Arab Emirates in 2014. The Turkish regime is now a crucial component of the global Islamist threat. Last year, following Turkish claims of an attempted coup against the regime, a TASC rally in support of Erdoğan outside the White House included Shehata and a number of prominent American Islamist leaders, such as Nihad Awad, the Executive Director of the terror-linked Council on American-Islamic Relations (CAIR). As the Investigative Project on Terrorism notes, Erdoğan's Justice and Development Party subsequently sent a delegation to the United States to hold meetings with senior CAIR officials. Since then, Awad has continued to meet with representatives of the Turkish regime. Such partnerships are not new. Since a coalition of U.S. Islamist organizations travelled to Turkey in 2014, prominent American Islamic groups linked to the Muslim Brotherhood have become some of Erdoğan's staunchest advocates in America. In 2014, the annual convention of the Islamic Society of North America (ISNA) featured three regime-linked speakers, including Erdoğan's senior advisor, İbrahim Kalın. ISNA, a Muslim Brotherhood front, was named by federal prosecutors as an unindicted co-conspirator during the 2008 Holy Land Foundation terrorism financing trial. 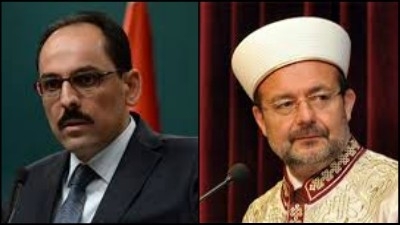 Erdoğan advisor Ibrahim Kalın (left) and Mehmet Görmez, Turkey's top cleric until retiring in August 2017. Also in 2014, Turkish regime official Mehmet Görmez recorded a video message for America's largest Islamic conference, organized jointly by two prominent Islamist organizations: the Muslim American Society and the Islamic Circle of North America (MAS-ICNA). In his message, Görmez announced the completion of a Turkish-funded mosque in Maryland, the Diyanet Center of America. The MAS-ICNA conference that year was funded by the "Turkish-backed" American Zakat Foundation. In return, MAS-ICNA announced that the "Turkish presidency, agencies, several NGOs, state-media TRT World and Daily Sabah will organize events during the summit in Chicago, while President Erdoğan's daughter ... will attend the summit as guest of honor." The Turkish regime and U.S. Islamist organizations have looked out for one another. Erdoğan has denounced American attempts to designate the Muslim Brotherhood as a terrorist organization. And in 2015, U.S. Islamist groups, including CAIR, released a statement opposing recognizing the slaughter of Armenians organized by Turkey in 1915 as a genocide. Turkey's intolerance for its critics is whitewashed by American Islamist groups. At the 2016 MAS-ICNA conference, Erdoğan's daughter defended the regime's purges – managing both to justify and deny mass-arrests of journalists. Prominent American Islamist operatives and clerics praised her speech. Lawful Islamist movements exploit liberal democracy to promote illiberal, anti-democratic ideology. In general, lawful Islamist movements such as the Muslim Brotherhood work to insert themselves into Western society, exploiting liberal, democratic bodies to promote their own illiberal and anti-democratic ideology. Proving itself to be a natural ally of the Muslim Brotherhood, Turkey makes use of this same deception: on September 18, Erdoğan's office demanded that NATO prevent a critic of the Turkish regime from speaking at a NATO Parliamentary Assembly conference organized by the Middle East Forum. 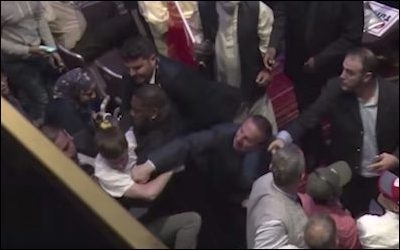 When the dissident appeared anyway, the Turkish delegation interrupted proceedings and then stormed out. Whether co-opting Western democracies to silence its critics, or funding American Islamist organizations with long histories of extremism and ties to terror, the Turkish regime is now a crucial component of the global Islamist threat. The West must recognize this, and work to counteract both. Sam Westrop is the director of Islamist Watch, a project of the Middle East Forum. Samantha Rose Mandeles is a coordinator at Islamist Watch.